This is pure love, love. 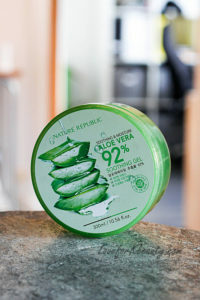 I simply love aloe gel and I have been using it for many years, The packaging I am not so happy with. I feel that a big jar is quite clumsy. And I don’t like the idea of dipping my fingers in the jar over and over again. I would prefer if the product would come in a tube instead. But since the product is so great I can actually overlook the problem. This is a cream I actually find really weird, the smell is weird, the thickness of it feels weird. So my first impression is just weird. It is made from red ginseng, which is known to have many benefits both for body and for skin. The cream is really thick, almost buttery in consistency and it never seems to penetrate the skin. I got 10 samples of this and thought I give it a try and to write a review for you guys. each samples last for about four applications, if you use it only on specific parts. I forgot to take pictures of the product itself so sorry for that. But it is a clear watery liquid. The full sized product comes in a bottle with a pump. So you get a lot of product for the money.